I enjoyed your interview. I haven't seen Columbo in years. Takes me back! Your work is beautiful. I simply can't pick a favorite. I am heading over to your blog now to check out more. I have been following Martina's blog for quite awhile and she is certainly mult-talented!! She failed to mention she also designs cross stitch patterns and shares the patterns on her blog. I stitched an adorable snowman pattern that she posted, be sure to check that out. Martina it was fun learning more about you! I enjoyed Columbo years and years ago when it was on tv too, I might have to re-watch them! Love all the works you posted here, some are unfamiliar to me and so nice to see! ein wunderschönes Interview. Bie viele von deinen Werken habe ich die Entstehung im Laufe der Zeit auf deinem Blog mitverfolgen können. Besonders deine Stiefmütterchen gefallen mir sehr gut. Vielen Dank, und wir haben auch schon einiges gemeinsam gestickt. Loved getting to know you more, and WOW beautiful stitching . Love the teddy pillow , you are one talented lady. Thank you very much, June. Martina I enjoyed learning more about you my friend! Would you please show a picture of your sweet rabbits on your blog? I would love to see them! I have not seen Columbo in many years. My husband and daughter are currently watching the Highway To Heaven series again. It is nice to watch the older series. I LOVE your rainbow quilt!! i will show my lovely rabbits soon on my block. So viele schone kreutzstich Sache aber es geffalt mir mehr das Dorf.AriadnefromGreece! Thank you very much, i love it too. Lovely creative projects you have shared, nice to meet you. Hallo, Martina~ Nice to read about you and your bunnies. :) Your rainbow quilt is just stunning as is your Santa's Village! Thank you very much, soon i will show a picture of my bunnies on my blog. Wow, da habe ich aber viel über dich erfahren. Tolle Bilder hast du gestickt. Deine LHN Village gefällt mir am besten. Wir sehen uns auf deinem Blog wieder. Vielen Dank liebe Lari, freue mich auf deinen Besuch. Ich dachte es mir schon, dich bald hier zu sehen. Und es war sehr interessant, mehr über dich zu lesen. Und ein paar deiner Werke wiederzusehen. Diese Teddies damals haben so richtig süchtig gemacht, nicht wahr? Ich habe auch noch ein Teddy Projekt, das ich noch fertig sticken muss, aber es fehlt nicht mehr viel. Ja es stimmt mit diesen Teddies hat das große Sticken angefangen, sie sind aber auch zu goldig und man kommt nicht um sie rum, zumindest ich nicht. Great answers. Thanks for sharing. Beautiful work! Hi Martine, schön, dich zu treffen! Tolle Stickarbeiten hast du da, gefallen mir gut. Thank you very much, Leonore. 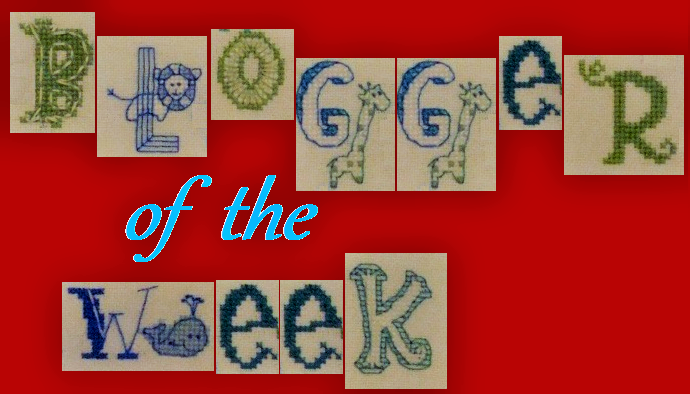 Always nice to learn more about fellow cross-stitching bloggers, Martina! I always love seeing your finishes and your beautiful quilts. And I love knowing you have bunnies :) Thanks for sharing with us! So very lovely to meet you, Martina and to see some of your gorgeous stitched pieces. Thank you so much, happy Weekend. Thank you very much, happy monday. Very beautiful stitching Martina and a pleasure to meet you! Martina, you have a lovely selection of work. The quilt that you designed is impressive.